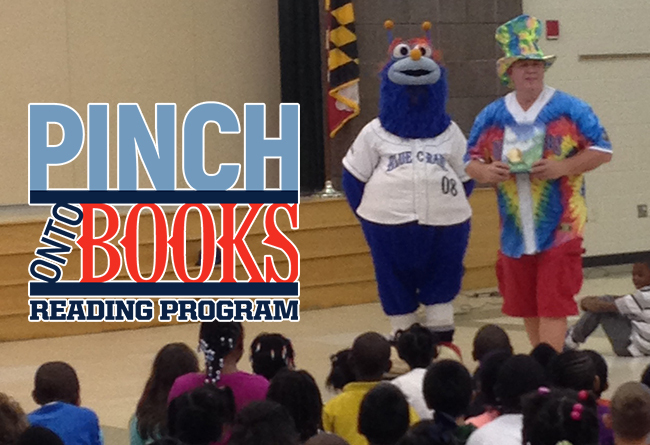 (Waldorf, Md., Jan. 11, 2018) - The Southern Maryland Blue Crabs have once again partnered with Educational Systems Federal Credit Union to bring back the “Pinch Onto Books” reading program for 2018. Since their inaugural season in 2008, the Blue Crabs have partnered with schools in the surrounding five counties to help motivate students to further their reading. Each student that signs up for the program is hand-delivered by the team a “Pinch Onto Books” bookmark. Students are then asked to read a minimum of four books, tracking their progress on the back of the special bookmarks. Once the student has read the minimum amount of books, the bookmark can be taken to the box office and exchanged for a ticket to the annual Reading Program Night at the ballpark. This year’s Reading Night is Saturday, May 12, 2018. Each school is also given the opportunity to have their bookmarks delivered as part of a Reading Assembly, hosted by the Blue Crabs mascot, Pinch. On top of that, the three schools that have the most participation are rewarded with a Pizza Party with Pinch. This all leads into the big night, as all participating schools come together at the ballpark to celebrate Reading Program Night. All students in the program have the opportunity to go on the field and participate in a pre-game parade and the high-five tunnel for the players entering the field. The winning classrooms will then be announced in a special on-field ceremony, recognizing their accomplishments throughout the school year. The team opens the 2018 season on April 27th at home against the Long Island Ducks. To save your seat at the ballpark for the upcoming season and other team news, visit www.somdbluecrabs.com or call 301-638-9788.